Apodizing, or change of aperture's transmission properties, also affects intensity distribution within the diffraction pattern it generates. The effect of apodization was mainly subject of speculations among amateur astronomers, until Harold R. Suiter published his book and articles, during the 1990s and at the beginning of this century, using diffraction calculation to find specific answers. This text uses his analysis and his diffraction program "Aperture", with somewhat expanded coverage of the effect of Gaussian apodization and potentially useful types of apodizing masks. There is a number of possible patterns of altering pupil light transmission. The starting point here is so called Gaussian pupil, where the change in wave amplitude over the pupil follows a Gaussian function (FIG. 111A). FIGURE 111A: Apodizing filter modulates wave amplitude (A) in the pupil according to the Gaussian function A=exp-(r/w)2, where exp is the natural logarithm base (Euler number, e) 2.718 under the negative exponent, in which r is the height in the pupil normalized to 1 (with 1 corresponding to the aperture radius, D/2) and w the Gaussian radius, at which transmission (t) drops to 1/e. Thus, Gaussian radius indicates the relative width of the bell-shaped amplitude curve centered around the axis (it is also related to the Gaussian's volume, which is equal to that of a cylinder of identical height with the base radius equal to w). Gaussian amplitude profile over the pupil has full amplitude (A=1) in the center, decreasing toward the edge. The smaller Gaussian width w, the greater amplitude suppression toward pupil edge, the wider central diffraction maxima, and the fainter ring structure. Amplitude profiles and corresponding PSF simulations are shown for w=∞ (uniform transmission), 1.5, 1, 0.7 and 0.4. As the plots below show, ring structure is nearly non existent at w~0.7, and further suppression of amplitude in the outer area mainly achieves significant central maxima expansion. So for an apodizing mask of this type the optimum Gaussian radius is w~0.7. With incoherent light, total energy in the pupil - or transmission - is proportional to the amplitude squared. Squaring, in effect, produces a narrower Gaussian, whose volume vs. volume of the cylinder equals the transmission coefficient (top right). For w=∞, 1.5, 1, 0.7 and 0.4 total transmission is 1, 0.663, 0.432, 0.241 and 0.080, respectively. 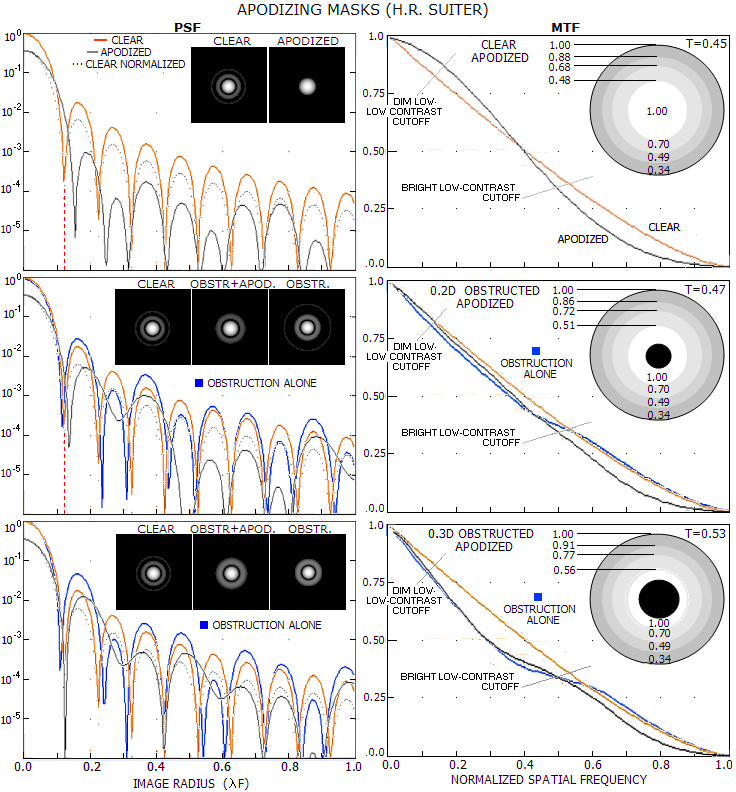 (2) impaired limiting stellar resolution, but improved resolution of unequal doubles with much fainter companion in the area of the first bright rings of the brighter principal star. At the point when diffraction rings entirely disappear (w<0.7), the FWHM - full width at half maximum (intensity) of the PSF - is moderately larger (~25%) than for uniform pupil. At w~0.7, with diffraction rings reappearing, but only "in theory" (the brightest ring is more than 2500 times fainter than peak intensity), the FWHM is about 20%, and at w~1 the FWHM is about 10% wider, with the first bright ring more than 4 times fainter than in the clear aperture (about as bright as its second bright ring). The encircled energy plots show that the relative energy within 1.22λF radius steadily increases from 84% for uniform pupil to 97% for w=0.7 Gaussian, which has less than 1% of energy outside its central maxima. Again, further reduction in the value of w does not seem justified, at least for general purpose. MTF plots (bottom) illustrate the gain, and the loss due to pupil apodization. Vanishing rings energy results in better contrast over low-to-mid MTF frequencies. Expanding central maxima, however, lowers it over mid-to-high frequency range. At w~1, the gain and loss are visually near equal; loss is already significantly larger nominally but, on the other hand, the mid-to-low frequency range covers much wider variety of details of about Airy disc in size and larger. This implies that somewhat greater reduction in w could still be worthwhile from the practical point of view. But even at its best, the gain in mid-to-low frequency range is relatively small. It is comparable to the gain of going from 1/6 wave P-V wavefront error of balanced primary spherical aberration to zero-aberration aperture, or from 0.91 Strehl to 1. And the price to pay is nominally significantly greater contrast loss in the high frequency range, including loss in threshold resolution for bright low-contrast (e.g. planetary) details. So far, it was assumed that the optical system with Gaussian pupil transmission is aberration-free. In the presence of aberrations, Gaussian transmission gradient over the pupil does not influence shape of the wavefront, but does influence the magnitude of wave contributions from different portions of the pupil. In general, contribution suppression increases toward the edge. If those portions of the wavefront are aberrated, it will reduce their destructive contribution. Graph at left shows how the four principal aberrations - spherical, coma, astigmatism and defocus - given in unit value for even pupil transmission, decrease with the Gaussian width w. Expectedly, the two aberrations that peak toward pupil edge over all, or significant portion of the outer wavefront area - astigmatism and defocus - are reduced the most. At w=0.7, the reduction is 0.92, 0.89, 0.74 and 0.72 for spherical aberration, coma, astigmatism and defocus, respectively. If there are two or more aberrations present, the combined reduction is greater than for any single aberration. As the negative effects of apodization quickly increase with further reduction in w, this is probably close to the maximum benefit achievable with apodization in this respect. The contrast transfer consideration in FIG. 111A strictly applies to the standard MTF pattern, i.e. one with sinusoidal intensity distribution. In general, there is no major difference if square-wave pattern, with evenly bright and dark bars is used, except that contrast transfer for the latter is somewhat higher over the range of frequencies. It can be concluded that Gaussian pupil is more useful in observing low contrast detail, either bright or dim, since contrast gain due to it covers most of the resolvable range for this detail type. However, this gain is likely to come at a price of somewhat compromised threshold resolution for this type of details. Independently of its effect on contrast transfer, the effect of Gaussian apodization on suppressing diffraction rings - and primarily the first bright ring - is beneficial in resolving, or detecting faint companions positioned in the first bright ring of the principal star. Another benefit from Gaussian apodization is that it generally increases the tolerance for inherent system aberrations. In other words, it does reduce the negative effect of any given level of conic surface aberrations - spherical, coma, astigmatism - as well as the effect of defocus. In the systems with relatively significant inherent aberrations - particularly astigmatism - it can produce noticeable improvement in the performance level based on this factor alone. Apodization is even more effective in suppressing the effects of local/zonal surface errors affecting the extreme outer area of the wavefront , such as turned edge. And, it is always important to consider the actual conditions of use. As Suiter points out, seeing error generally worsens contrast and resolution in the high-frequency MTF range. In larger amateurs apertures, details in this range are observable only in a fraction of the time, at best (FIG. 92B). In such case, there is little or no harm from the nominal contrast drop in this range, but the advantage of improved contrast in the mid-to-low frequency range remains. Practical problem with Gaussian pupils is that fabricating substrate producing such an accurate fall off in pupil amplitude/transmission requires complex technology, generally unavailable to the amateurs. Suiter solves that problem by designing step-apodizers made of a widely available material, an ordinary window screen (FIG. 111B). FIGURE 111B: The effect of screen apodizers on PSF and MTF for unobstructed (clear), 0.2D and 0.3D obstructed apertures. Suiter's measurement for a particular (common aluminum) window screen gave 0.7, 0.49 and 0.34 transmission for a single, doubled, and triple layer, respectively. There is no significant difference in effect due to the somewhat varying mask configuration in these three examples; it is mainly to nearly compensate for additional light loss due to the obscuration by central obstruction. Total transmission T is given for the mask alone, to make them directly comparable in that respect; actual transmission is (T-o2), o being the relative diameter of c. obstruction in units of aperture diameter. The mask for unobstructed aperture (TOP) produces effect comparable to the Gaussian pupil with w~0.75. PSF shows significantly reduced 1st bright ring intensity, which is now fainter than the 2nd bright ring in unpodized clear aperture, with the 2nd bright ring practically disappearing (apodized PSF - black - compares to the dotted plot, which is the clear unapodized pupil's PSF normalized to the peak intensity of apodized pupil). MTF shows relatively small contrast improvement from ~0.3 frequency down, but also that the enlargement of central maxima is lowering contrast transfer in mid frequencies, enough to significantly reduce limit to resolution for bright low-contrast details. With 0.2D central obstruction (MIDDLE), central maxima is noticeably smaller, although still larger than in clear aperture. First bright ring is nearly as bright as in clear unapodized aperture, with 2nd bright ring collapsing into a minima between the 1st and 3rd bright ring. There is only a small gain from somewhat dimmer 1st bright ring, but at the price of enlarged central maxima (PSF plot for clear unapodized pupil - orange - compares to the unapodized obstructed pupil - blue - while the apodized obstructed pupil - black - compares to the clear unapodized pupil PSF normalized to the apodizet pupil's central intensity - dotted). Not surprisingly, MTF plot shows apodized obstructed aperture having only slightly better contrast transfer than that with apodizer in the low, but inferior to it in the high-frequency range. Apodizing 0.3D obstructed aperture (BOTTOM) results in the 1st bright ring as bright as w/o apodization, only expanding to engulf the 2nd bright ring, with the 3rd ring nearly as bright as in a clear unapodized aperture. Consequently, contrast transfer over mid-to-low frequencies is nearly identical to that with obstruction alone; with the central maxima enlarged to somewhat over its size in clear unapodized aperture, the only significant effect is a drop of contrast transfer in the high-frequency range. In general, this step apodizer will produce similar effect to that of Gaussian pupil transmission it is comparable to with respect to the average drop off toward the pupil edge. There is an important difference between the two, and it is that step apodizer does not affect amplitude of individual waves - it selectively blocks them, or transmits. In coherent light, it would produce reduction in the complex amplitude (i.e. the sum of individual wave amplitudes) proportional to the pupil area blocked in the total area, with the energy (light transmission) proportional to this relative area squared. For instance, a mask blocking half of the pupil area would reduce the energy fourfold. In incoherent light - which is closer to the kind of light coming from astronomical objects - the energy is a sum of squared individual wave amplitudes. Hence energy transmission is proportional to the clear pupil area: blocking half of it will have it reduced twofold. More important, however, is that this different dependence of the energy on the aperture area would cause differences in point-source PSF, hence in the corresponding MTF as well. Similarly to case of the effect of central obstruction, the effect of apodizing mask should be significantly smaller in incoherent light, where the blocked out energy is deducted directly at the level of energy, not at the level of amplitude. The diffraction relation used by Suiter is from the domain of conventional treatment of diffraction effects, assuming near-monochromatic - in effect coherent - point source. And so is, according to its output, the underlying algorithm used by OSLO. If so, effects of pupil apodizing in the actual use by amateurs are significantly weaker than these shown, although they should be generally similar in their form. In other words, it would require significantly stronger apodizing in incoherent light to achieve effects shown here in incoherent light. With this in mind, follows an overview of some basic principles in designing apodizing mask, and the effect of varying parameters of its simplest configurations. Starting with the Gaussian transmission curves above, a simpler, nearly as effective apodizers can be put together as well (FIG. 111C). Additional purpose is to illustrate the degree of change in the diffraction effect as a result of different mask shading patterns. FIGURE 111C: Alternative apodizing masks based on w=1 Gaussian transmission profile. Except for the central pupil portion, Gaussian fall off is nearly linear. That makes it easy to approximate a corresponding average transmission for any chosen zone. For simplicity, central zone has 100% (i.e. 1) transmission, and multiple shaded rings are assumed to be of equal width. With a 2-zone mask (TOP, left), geometric average of the Gaussian suggests ~0.56 transmission for the outer zone (in the original concept, this would be amplitude transmission, but in the case of a mesh screen in incoherent light, it is the actual light transmission). However, considering that the outer half of it has larger area and lower transmission than its inner half, it is closer to the actual transmission profile if the inner edge of the shaded zone is shifted somewhat further out, and the transmission reduced somewhat more. Taking, arbitrarily, 0.6 radius as the beginning of the shaded zone, and 0.4 transmission coefficient over it, results in significantly reduced intensity of the first three bright rings (which effectively become two rings, with the 2nd bright ring collapsing into a minima between them), but also noticeably enlarged central maxima. Compared to the 4-zone Suiter's mask, contrast gain over the lower MTF frequencies is relatively small vs. contrast loss in the mid-high frequencies. However, just by increasing the shaded zone transmission to 0.6, the contrast gain/loss ratio noticeably improves; the gain is still less than with the 4-zone mask, but it is greater than with it relative to the loss at higher frequencies. The contrast improvement in the low-to-mid frequencies comes despite brighter rings, which indicates, again, that at this level of intensity they are less of a factor than the size of central maxima. It also illustrates the main characteristic of apodizing on diffraction pattern: darkening outer pupil area reduces ring brightness, but enlarges central maxima, while darkening of the central pupil area (modality of which is central obstruction) does the opposite, brightening the rings and reducing the central maxima. The 3-zone mask does not bring much of improvement: the contrast gain is yet slightly larger, but so is the loss. And the 4-zone mask has nearly as much contrast gain as Suiter's, but less of contrast loss. Slightly less of both, lower-frequencies gain and higher-frequency loss is due to somewhat less reduced transmission in the outer pupil area (note that the total transmission figure with each mask is as given by Suiter's software; since it assumes coherent source, the figures are lower than what they would be with incoherent light, i.e. in the actual use - 0.62, 0.74, 0.67 and 0.6, from top to bottom, respectively). Unfortunately, but expected, the beneficial effect of these masks also diminishes with the increase in central obstruction. Some simple narrow-purpose mask profiles would include those with a single-layer screen zone featuring a concentric ring with further reduced transmission. In general, a darkened, or opaque ring in the outer pupil area tends to reduce brightness of the first 2-3 bright rings, but at the price of shifting significant portion of energy to the rings farther out. Multiple rings have similar effect. If properly designed, such mask can shift the energy far from the central maxima, with little or no ill effect on contrast in the actual observing, while benefiting from the darkened close rings. Unfortunately, that also comes at the price of enlarged central maxima. In all, apodizing mask can produce effects beneficial for observing extended details larger than roughly twice the stellar resolution limit. It is not dramatic: generally less than the benefit of correcting 1/4 wave P-V of spherical aberration, but it is easy to employ and deploy, and every little bit can count. Apodizer can also be helpful in resolving close unequal doubles, with the faint companion situated in the first bright ring of the principal star. These beneficial effects, however, come at a price of contrast loss with details close and at the limit of resolution. In general, benefits of apodizing are greater for larger apertures, which are due to the larger seeing error typically able to resolve only details in their mid-to-low frequency range. Finally, apodizing mask will have little effect in apertures with central obstruction significantly larger than 0.2D.